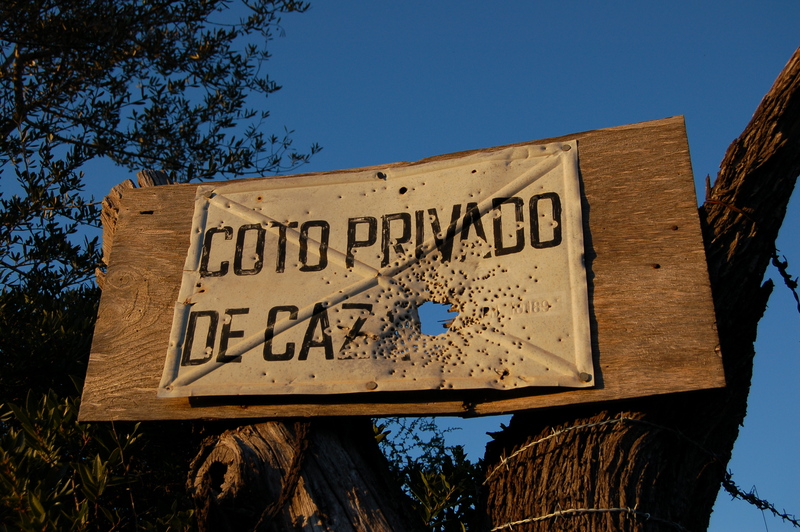 The official shooting season has finished on Mallorca for the time being. The silencing of the guns means our concerns for the safety of our cat clan are lessened. The seven outdoor cats that have adopted us over the past few years spend quite a few of the daylight hours fairly close to our home – and we can often catch a glimpse of one or more of them snuggled beneath a shrub somewhere in our valley. But their natural prowling instincts kick in after dark and in the winter it is often still dark when the first gunshots are heard. We’ve often wondered about the hunters’ ability to see what they are trying to aim at during these dark mornings and on those days when fog lingers. And these are the times we worry most about the cats. Thankfully, for the time being, the guns are now silent. But, of course, there are plenty of other hazards for cats in the countryside – both domestic and feral. One of these is the risk of parasites. The damned things are everywhere and, for this reason, the responsible thing for cat owners to do is take protective measures, which can be in the form of tablets or pipettes. 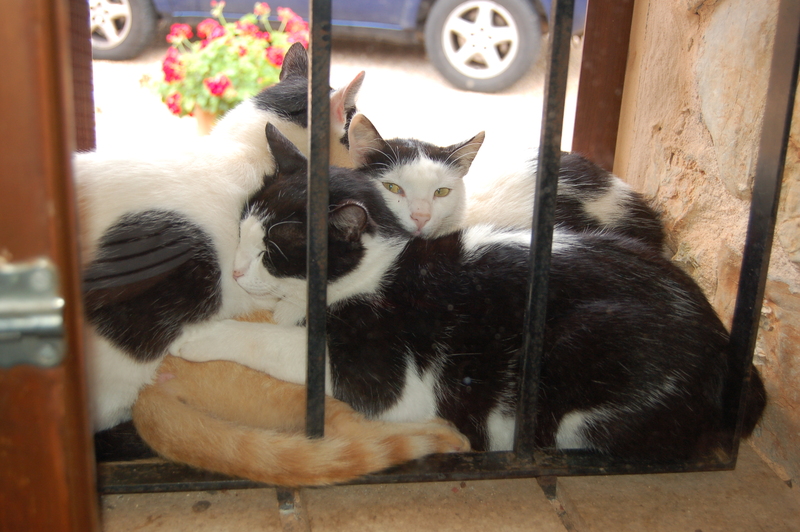 According to our vet, the risk of becoming infested is increased where more than five cats live in close commune. Now we don’t ‘own’ seven of our cats, but we have taken responsibility for their welfare – since they have made our land their home. 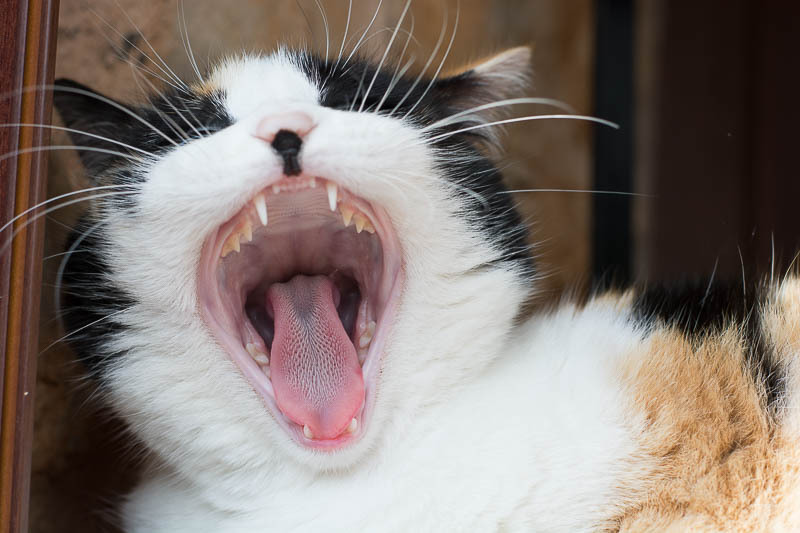 We went down the pipette option, as anyone who has ever tried to give even a friendly domestic moggy will understand how difficult it would be to pop a pill down the throat of a semi-feral feline. We do, after all, have plenty of use for our fingers . . . But even pipettes may not offer 100% protection. Last week two of our cats, little Pip and shy Chico, both fell ill. Chico hadn’t been for food for four days but we had spotted him sitting at the end of the field. We’d taken food down to tempt him but he wouldn’t come near us, disappearing over the stone wall into the next field as we approached. Chico – back to health and enjoying his family again. He’s the one facing the camera. Meanwhile Pip also went off her food. Hey, you may say, cats do that from time to time. But not Pip. She’s the first at the door waiting for us to bring out the cat bowls with their food and the one that likes to ‘tidy away’ any food left by the others. She was also rather subdued – another unusual sign – so we took her to the vet’s on Monday; it was the first of a few visits for her last week. On Friday morning we found Chico sitting in our dining window recess. He seemed so listless that we immediately took him to the vet’s, where he was found to have a low temperature – a dangerous thing for a cat. “No, I don’t take pills, thank you!” But Pip is back in fine form. Long story short, after some seven visits in four days to our local vet’s last week, various tests and treatments, and saying adios to several hundred euros, Pip and Chico are now back to good health and eating well again. The cause of all the problems was a type of parasite. So you can never be too sure . . .